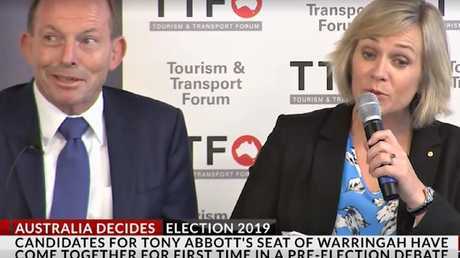 TONY Abbott finally came face-to-face with his challenger in Warringah, former Olympian Zali Steggall, during a pre-election debate this morning. It didn't take long for the tension to boil over. 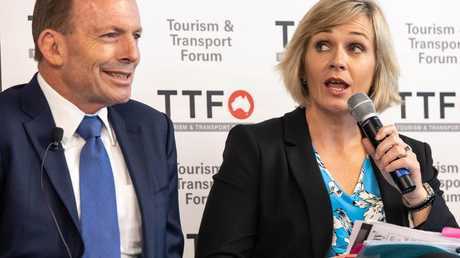 The debate started with a discussion of the Northern Beaches Tunnel, an infrastructure project Mr Abbott has made the centrepiece of his campaign. Ms Steggall said she still had press clippings from 1994, when the tunnel was first promised to voters. "The overwhelming issue for the electorate is to get some action. Action that people can actually truly believe in. And to feel represented, that there is actually a voice in parliament that actually cares about the concerns of the electorate and intends to represent those concerns," she said. "Are you in favour of the tunnel?" Mr Abbott interjected. "I am in favour of the tunnel Mr Abbott, in fact. Because I know your lying advertising has been misrepresenting my position," Ms Steggall said. 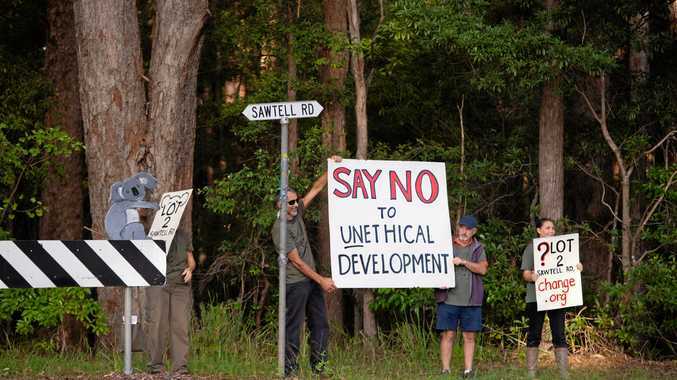 "I am in fact in favour of the tunnel, but what we do want to hear is a business case, because Infrastructure Australia still lists the project as a 10-15 year long term plan." "So you're in favour of it if the business case pans out," Mr Abbott said. "No, I'm in favour of it and I want to make sure the Australian people, and the electorate, are not sold a dud," she replied. "So you think it might be a dud?" said Mr Abbott, interrupting her again. "Would you like to let me finish?" Ms Steggall shot back. "It has to be future proof. We don't want another cross-city tunnel disaster, that has no financial model, that basically the people of the electorate are left paying and subsidising something that doesn't work." The debate's moderator, Sky News political editor David Speers, then threw back to Mr Abbott for his reaction. "Isn't that fair enough?" he asked. 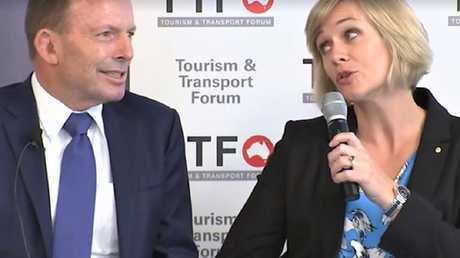 The former prime minister started to answer, but this time Ms Steggall interrupted him. "Can I just say, this tunnel needs to take into account clean, future public transport. It's the main issue the people of Warringah want to see," she said. "So you would rather see what, cleaner public transport, than a tunnel like this?" Speers asked. "No. The whole point is cleaner public transport using the tunnel, so that in fact we have efficient transport from the beaches, through the electorate," Ms Steggall replied. "But you want to make sure the numbers stack up on that," he clarified. "Well, who wouldn't?" she said. At that point Mr Abbott finally got to jump back in. "Tony Abbott, what's wrong with that approach, making sure it all stacks up?" Speers asked. "Look, it just has to go ahead. It just has to go ahead," Mr Abbott said. "This is a necessary investment in the amenity of an area which has been neglected by state and federal Labor governments for far too long." 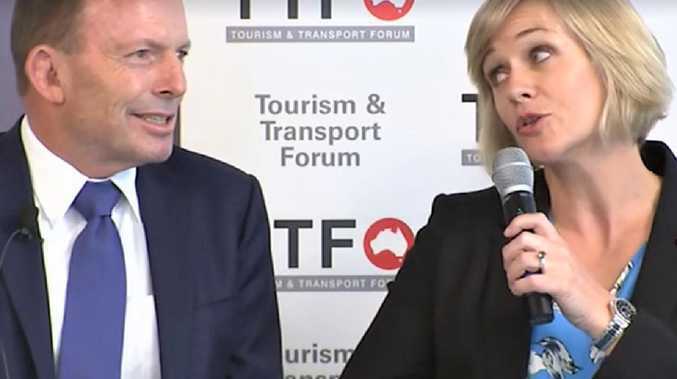 When it was put to Mr Abbott that he had been the local member for a quarter of a century, he said he needed the "coincidence" of having Liberal governments at state and federal level at the same time before the tunnel project could go ahead. "These projects don't happen overnight. I wish they happened quicker, but as you know, a project of this magnitude requires an enormous amount of preparation." Spare a thought for the other candidates on stage - Labor's Dean Harris, the Greens' Kristyn Glanville and independent Susan Moylan-Coombs - who observed that entire opening exchange in silence before they got to say anything. The truth is, they are all on the periphery of Warringah's politics. It is very much a one-on-one battle between Mr Abbott and Ms Steggall.